KleenGuard Personal Protective Equipment (PPE) enables rather than inhibits – allowing for maximum productivity and safety for you and your employees. Kleenguard A65 Flame Resistant Coveralls (with Hood & Boots) are a great addition when offering your team comfortable protective clothing is a must. They are designed for protection against non-hazardous and hazardous dust in areas where exposure to sparks is possible. Kleenguard A65 is breathable, with a high moisture vapor transmission rate, to be worn comfortably over flame-resistance garments. The material is flame resistant and compliant with NFPA 701 FLAME PROPOGATION TEST (1999 edition and complies with flame resistance requirements by paragraph 6.1 of CAN/CGSB-155.2-2000. 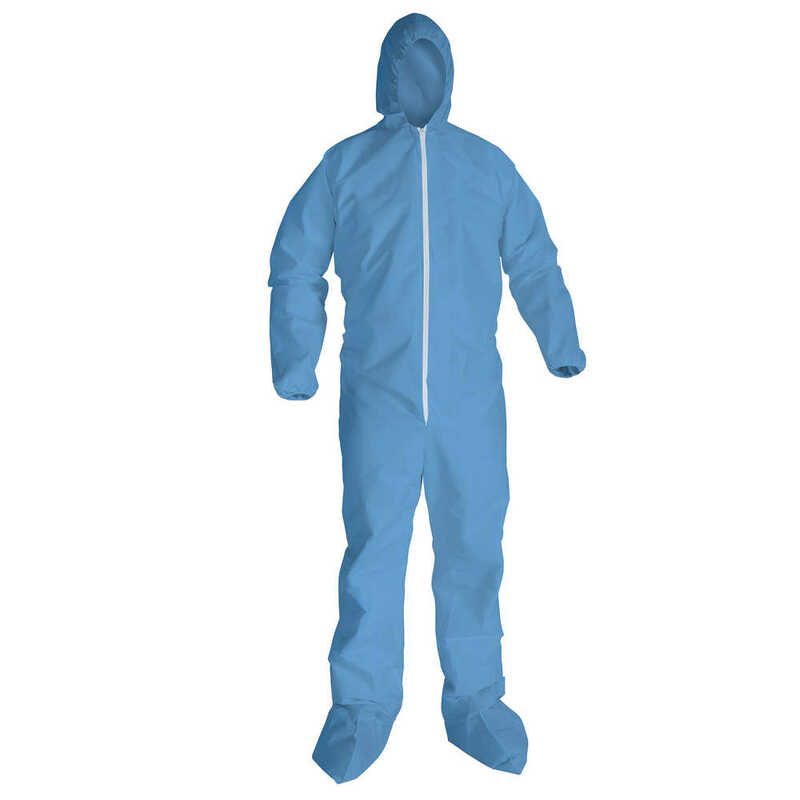 Each hooded protective suit comes complete with boots, a zippered front, serged seams and elastic wrists and ankles (EWA) and the design meets ANSI/ISEA 101-1996 sizing standards. These coveralls pass NFPA 99 for antistatic materials and deal for use when workers may be exposed to sparks in environments such as oil refining, utilities, welding processes and grinding processes. Note: Do not use for fire protection. Avoid open flame or intense heat. Kleenguard A65 garments do not provide thermal insulation or protection. Making the right Personal Protection choice is difficult. Perform with distinction with KleenGuard Personal Protective Equipment (PPE).